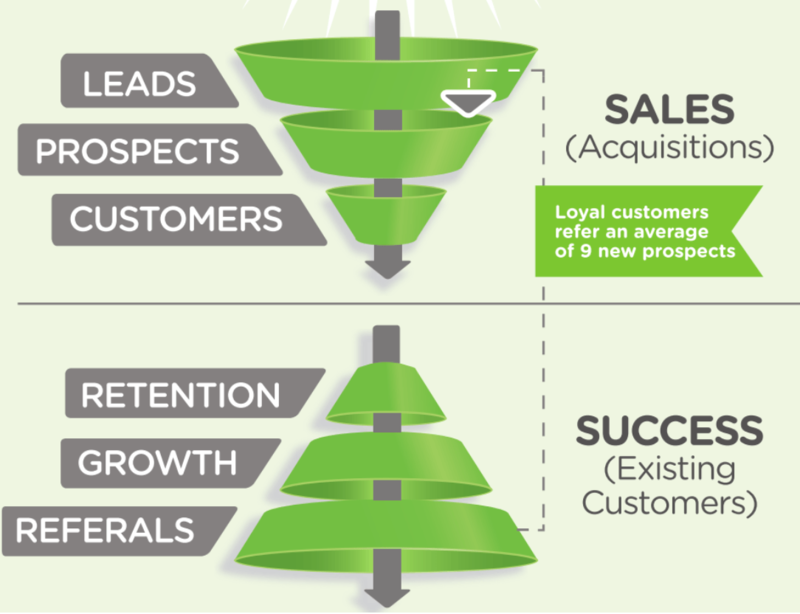 Historically, the sales funnel has been considered linear. Prospects turned into leads, leads turned into customers, and customers became repeat buyers. But, processes evolve and so has the sales funnel, especially in the SaaS world. Prospects don’t just come from cold calls anymore. More than ever, prospects are referred from existing, loyal customers. Loyal customers are created through a multitude of ways – one of which is a customer success program. Beyond simply managing a customer’s account and checking in, customer success is an operational approach through which the customer is guided in adoption and engagement with your software. With a solid customer success strategy, customer success managers aren’t just reacting to customer issues, they have proactive measures in place to ensure a customer’s success, identify potential upsell opportunities and reduce churn. When a customer is guided through SaaS adoption with a proactive customer success strategy, it’s likely they’ll end up as a loyal user and an advocate for your solution. These are the customers, who after experiencing your consistent, branded solution, will come to represent as much as 70+ percent of total annual recurring revenue for an organization. There’s convincing math to demonstrate the value they add. Consider for a moment the two lines in the graph above. Let’s call them “Company Grey” and “Company Green.” With a steady 20 percent growth rate and retaining 90 percent of its customers, Company Grey is doing well. Because it has a customer success team in place, their team feels they have a good strategy for customer retention in combination with a hefty outbound marketing strategy for customer acquisition. 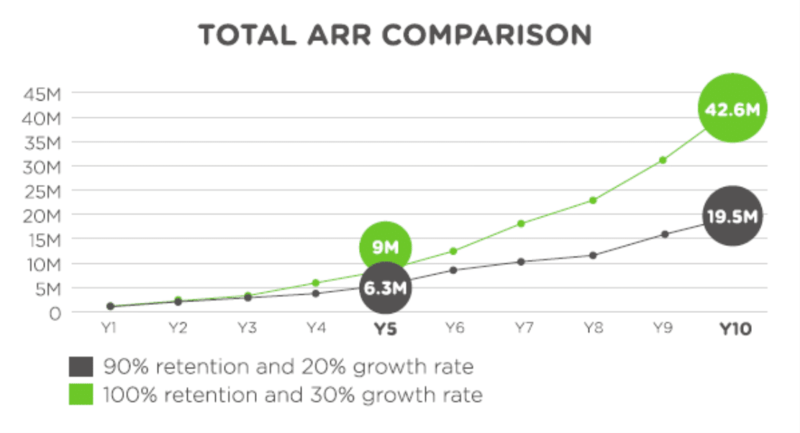 Company Grey hits nearly $20 million in ARR over the course of 10 years. Company Green, on the other hand, retains 100 percent of customers by having an extensive customer success strategy, and by implementing a customer success platform. Though it has a solid marketing strategy, it does less outbound marketing than Company Grey to obtain customers. However, it has a 30 percent growth rate due to inbound referrals from existing customers. Because of this, Company Green reaches more than $40 million in ARR over the same 10 years. And, with double the ARR, should company Grey and Green both be up for acquisition, Company Green could sell for twice what Company Grey would. Existing customers that are loyal and referenceable advocates feed your funnel for new sales, which dramatically affects your total ARR. Budget and spend should be adjusted to reflect the value of customer retention over new (logo) acquisition. So often, sales teams are the rockstars in an organization – known for bringing in shiny new accounts and recognizable customer names. The high visibility of their work gets them continual praise, whereas customer retention and success are far less visible across the organization. But, the influence of existing customers on new customers cannot be undervalued. It isn’t unrealistic to expect that having a strong base of referenceable customers can yield a 10 percent increase in new logo acquisition. Because of the high value of existing customers, it’s worth reconsidering how you organize your customer acquisition funnel. Outlined in the funnel below, you can see how referrals from existing customers can be a large source of leads for the organization. While customer success managers are not salespeople, they’re clearly responsible (directly or indirectly, depending on your charter) for account growth and referrals. With a new perspective on your customers as a source of leads, the sales cycle must no longer rely on turning cold prospects into warm leads. When you obtain customers by way of referral, they’re already aware of the value you’re providing to another organization. They’re interested in what you have to offer and, by obtaining them as a customer and keeping them happy and successful with your product, the cycle will repeat. 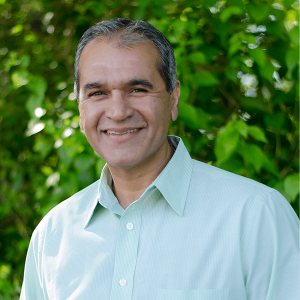 This understanding is foundational to the executive decision to invest in Customer Success. The math is irrefutable and the next steps are pivotal. Take a look at the infographic below which illustrates these claims.